Since 2004, Woodcraft store owners, employees and volunteers have collectively supported more than 175,000 service men and women with handmade wood pens from home. Gamma Phi Beta sorority member Gianna McCrystal turns one of more than 100 pens made by San Diego State University students this year. Our brothers and sisters in uniform who serve for all of us will benefit by knowing someone else cares about the sacrifices they make. 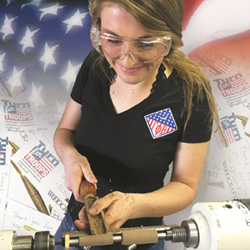 For the 15th year in a row, volunteer woodturners gathered at Woodcraft stores nationwide over Veterans Day weekend to make pens during the Turn for Troops National Turn-a-Thon. This year’s event produced 17,097 one-of-a-kind wood pens which will be sent to active duty or recovering military personnel across the globe. That total is the second highest in the event’s 15-year history, with the record year being 2009 with 17,228 pens. Since the first event in 2004, 175,224 pens have been crafted for the troops. Though many volunteers are practiced turners, for a lot of folks woodturning is a first-time experience. Anyone with a desire to say “thank you” to the troops can come in and make pens during a Turn for Troops event. Youth, college students, Veterans and senior citizens have all given their time to turn pens, with an opportunity to include a personalized note with each pen made. The San Diego State University Gamma Phi Beta sorority and Phi Gamma Delta (Fiji) fraternity have participated in Turn for Troops by making more than 400 pens over the last three years. Four other Woodcraft stores have exceeded the 10k mark since the program began: Tucson (19,308), Nashville (18,921), Boise (16,154) and Grand Rapids (15,682). The top four contributing stores for 2018 are Grand Rapids (2,981), Tucson (1,764), Nashville (1,390) and Boise (1,086). The Boise location has been a Top 4 contributor all 15 years. Other stores submitting 1,000+ pens in 2018 are Seattle (1,054) and Milwaukee (1,050). The single highest contribution overall was Grand Rapids with 4,004 in 2016. For more information about Woodcraft, please contact the Woodcraft store nearest you, visit Woodcraft or call (800) 535-4482. Click here to learn more about Woodcraft franchise opportunities or email woodcraftfranchise(at)woodcraft.com. 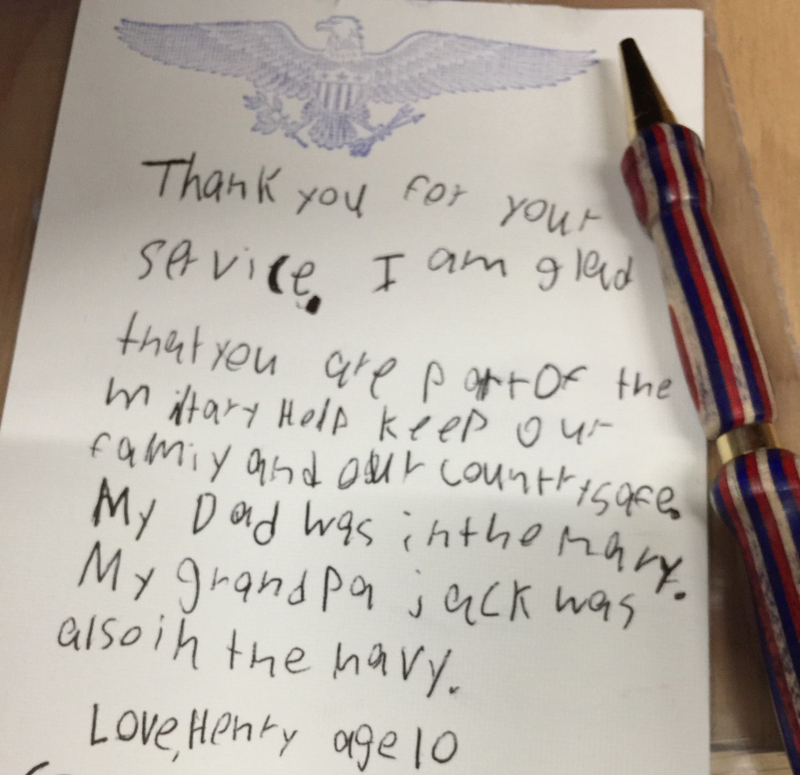 Henry, age 10, expressed his thanks in a handwritten note.